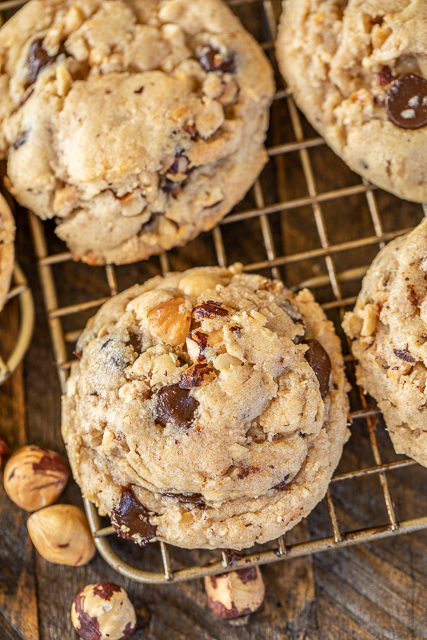 These Dark Chocolate Chip Hazelnut Cookies were inspired by our trip to Italy this past Summer. We were eating loads of Nutella and snacking on hazelnuts. Chicken Legs said I need to make a dark chocolate and hazelnut cookie. Kind of like a deconstructed Nutella cookie. I thought that sounded delicious!!! I came home and starting experimenting with the recipe. The end result was perfection! 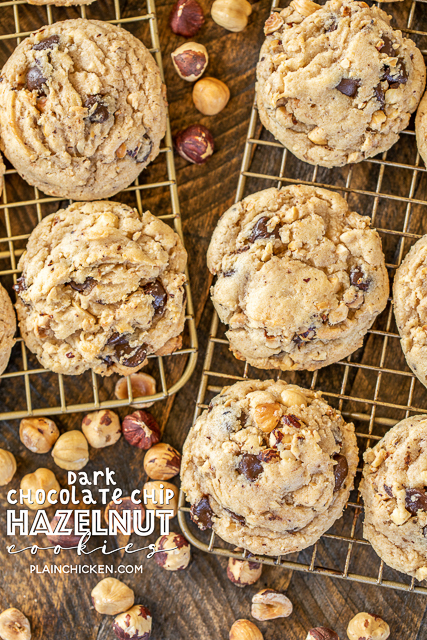 We LOVED these Dark Chocolate Chip Hazelnut Cookies. OMG - they are dangerously delicious! I had to give them away so we wouldn't get the whole batch ourselves. All you need is a big glass of milk and you are set! FYI - I found the hazelnuts at Trader Joe's. Trader Joe's has a great selection of nuts and great prices too! 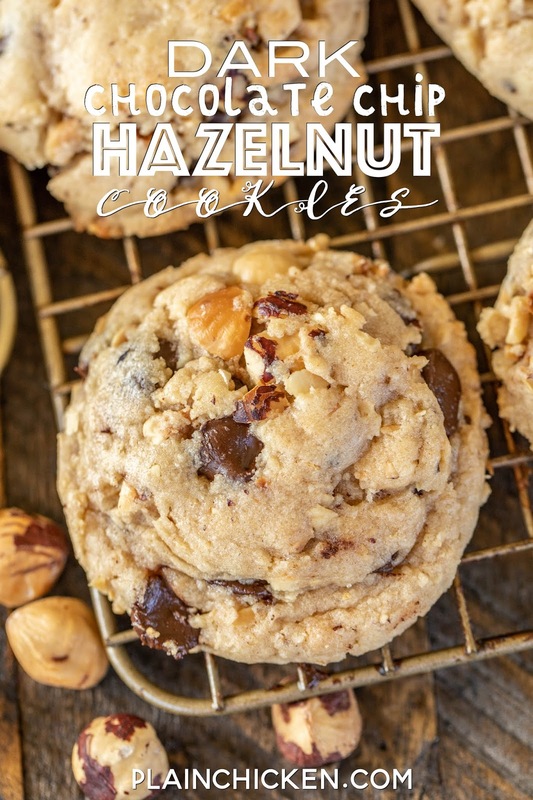 You can make these Dark Chocolate Chip Hazelnut Cookies ahead of time and refrigerate the dough overnight. 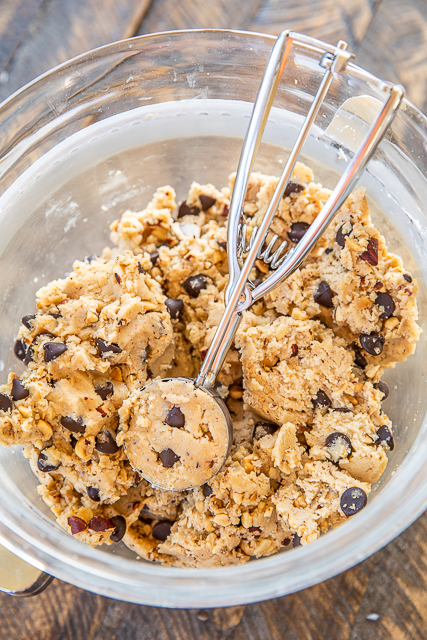 You can also scoop the dough and freeze it for a quick dessert later. 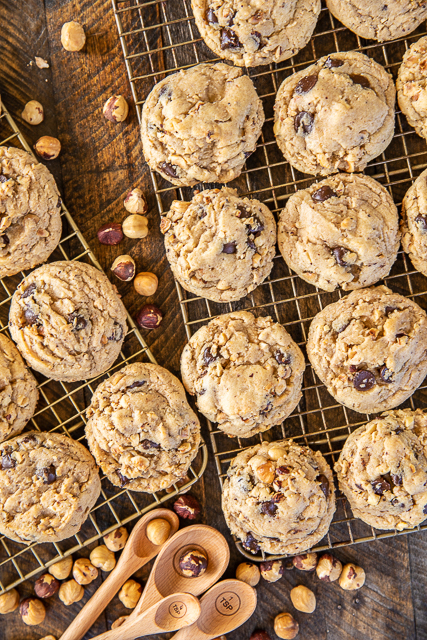 To freeze - use a large cookie scoop and scoop the dough onto a parchment lined pan. Just put as many as you can on the pan. Don't worry about the spacing. Pop the pan in the freezer and let the dough freeze. Once the dough balls are frozen, put them in a freezer bag. Now you can pull out as many as you wish to bake. You can bake the dough frozen, just add a few extra minutes to the cooking time. Stir in dark chocolate chips, and hazelnuts. And why didn't we make these when I was there??? bhahaha they look amazing!!! I'm going to make some this weekend!